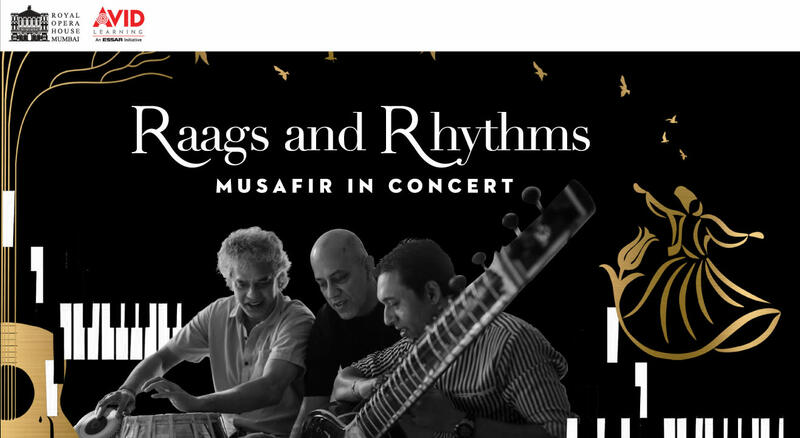 This rare performance will feature the ensemble, Musafir comprising Tabla Maestro Ustad Fazal Qureshi, Keyboardist Zubin Balaporia, Sitarist Hidayat Husain Khan accompanied by Guitarist Sanjay Divecha, Percussionist Gautam Sharma, Bass Player Sheldon D’Silva and Violinist Kushmita Biswakarma. The ensemble will also be joined on stage by Sufi Singer Smita Bellur whose powerful vocals are sure to enrich this myriad of musical melodies. These accomplished musicians will attempt to break the distinctions between genres and generations through music that dissolves boundaries rather than crossing them. Each artiste will also be recreating compositions originally crafted by their legendary ancestors through their own personal interpretations. They equally position themselves within the legacy of their ancestors while pushing the envelope of what collaborative music truly can be. Hidayat Husain Khan is the son of the legendary sitar maestro Ustad Vilayat Khan, Hidayat has been globally acclaimed and, as The London Times aptly says, "the tradition carries on impeccably". Rolling Stones praises him and describes how his music is “Jazzing up the sitar." Hidayat Khan has managed to successfully travel between traditional classical music and innovative contemporary sounds. Zubin Balaporia is a composer/performer based in Mumbai. He started playing the piano at the age of six and has never looked back. Since 1988 he has produced music and been involved in sound design for Television and Radio commercials as well as Corporate Films for many major international brands. He has worked as Musical Director for musical theatre productions such as The Sound Of Music, My Fair Lady, Jesus Christ Superstar and I Believe as well as for several major documentary films. Zubin has also been Music Director and composed the Background Score for a few feature films namely, DEV, Honeymoon Travels, Lafangey Parindey and Fireflies. For the last twenty years Zubin has performed, toured and recorded with the well established Indian rock band, Indus Creed, formerly known as Rock Machine. The band has the distinction of giving the face of Indian rock international exposure and recognition. He has recorded, arranged, performed and co-produced all four of the Rock Machine/Indus Creed’s albums – Rock ‘n’ Roll Renegade, The Second Coming, Indus Creed and most recently Evolve. Indus Creed has toured the length and breadth of India, and have performed in Abu Dhabi, Dubai, and Singapore, and represented the country at the Festival of India in the former Soviet Union. They have performed at other major festivals including the Peter Gabriel sponsored Womad festival held in the United Kingdom at Reading as well as at some major clubs in the United Kingdom & United States of America. ndus Creed has opened performances for international bands like Bon Jovi and Europe as well as for guitar maestro Carlos Santana. They’ve also performed with Slash, guitarist for Guns ‘n’ Roses and alongside British rock band, Uriah Heap and won the MTV Asian Video Music Award, Channel V Best Indian Band Award, the Indian Recording Arts Academy’s and Vh1 Music Channel’s Hall of Fame Awards. In 2012, Zubin won the Rolling Stones/Jack Daniels award for Best Keyboardist. He is currently teaching “Scoring to Picture” at The True School of Music. Hailing from a background that reverberates with the taal of the tabla, music has been Fazal Qureshi's natural inheritance. Under the guidance of his Guru and father the late great tabla maestro, Ustad Alla Rakha, and with the inspiration drawn from his brother, Ustad Zakir Hussain, Fazal has developed a unique style that is distinguished for its fine sense of rhythm, versatility and eloquence. He performs both as a soloist and as an accompanist. His deep rooted knowledge and dedication to Indian classical music helps him accompany North as well as South Indian instrumentalists, vocalists and dancers. The musicians he has performed with include Ustad Alla Rakha, Ustad Zakir Hussain, Pandit Shiv Kumar Sharma, Pandit Hariprasad Chaurasia, Ustad Amjad Ali Khan, Ustad Sultan Khan, Dr. L. Subramaniam, L. Shankar, Vikku Vinayakram, U. Srinivas, Ustad Shahid Parvez, and Sitara Devi. Fazal has expanded his horizons by being involved with other styles of music of the world especially Jazz and Western classical music, and has performed with many well known Jazz musicians. For the last 16 years he has been associated with Mynta, his world music band based in Sweden. They have performed all over the world and have released six immensely popular albums. Besides being a performer he has also composed music for Mynta and for various other events. He has now started composing music for Indian films and is currently working on an album of his own compositions, thus adding to his versatility as a musician. Fazal is emerging as a name whose reputation is not just sustained by his strong family lineage, but on personal achievements as well. Royal Opera House, Mumbai is widely touted as Mumbai’s Cultural Crown Jewel and India’s only surviving Opera House. The original idea for the space was conceived of in 1908, inaugurated in 1911 by King George V, and eventually completed in 1916. The design incorporated a blend of European and Indian detailing. The space became a cinema in later years before falling into disrepair and shutting by the 1990s. Fittingly, the space has been owned by the Royal Family of Gondal since 1952 and was eventually restored by conservation architect, Abha Narain Lambah under the leadership of His Highness, Maharaja Shri Jyotendrasinhji of Gondal. The Royal Opera House Mumbai, now one of the last remaining Baroque structures in the city, reopened after 23 years in October 2016. The building was included on the 2012 World Monuments Watch to raise awareness about its history and significance, and support preservation efforts. The building has since been recognized with an Award of Merit in the 2017 UNESCO Asia-Pacific Awards for Cultural Heritage Conservation. The restored facilities feature a 575-seater 3-level auditorium with an orchestra pit and state of the art technological upgradations, including acoustics, stagecraft, lighting and air-conditioning, alongside retaining the old world charm of the proscenium stage, the royal boxes and the magnificent regal chandeliers. Some more enhancements to the venue include a motorized screen, co-axial ceiling speaker system, Four-zone volume control and all round wifi access. Today, it stands as a key performance and creative hub in the city’s cultural landscape, while being a premier heritage landmark. Avid Learning, a public programming platform and cultural arm of the Essar Group, has conducted over 1000 programs and connected with more than 125,000 individuals since its inception in 2009. Driven by the belief that Learning Never Stops, AVID’s multiple formats like Workshops, Panel Discussions, Gallery Walkthroughs, and Festival Platforms create a dynamic and interactive atmosphere that stimulates intellectual and creative growth across the fields of Culture & Heritage, Literature, Art and Innovation.